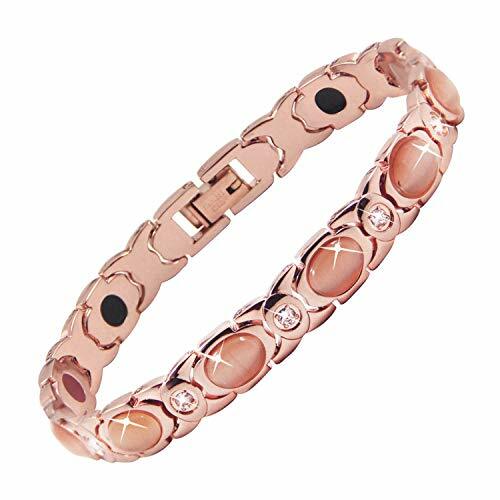 This rose gold plated bracelet inset cubic zirconia stone and natural cat eye stone, perfect gift for ladies at any time. This is 3 in 1 bracelets, which contains negative ions, Far infrared and germanium. As no magnets inside, so you could still wear it even you have a pacemaker, defibrillator, insulin pump, or any other implanted electro-medical device. Will not rust or corrosive even in seawater. Strong and durable to hold for long time. It could re-polish by any jeweler, and will not oxidize or turn back. Negative ions could increase the flow of oxygen into the brain, resulting in higher alertness, decreased drowsiness and more mental energy. The Far Infrared Rays Benefit It helps to increase blood circulation, the level of oxygen and white blood cells,Strengthening of the immune system, Increase in metabolism,Relief from stress and fatigue. It is believed to have blood-thinning effects and may be beneficial to people with high VLDL triglyceride levels,low protein or phosphorus,very high calcium,or poor circulation due to atherosclerosis. Try our Titanium Magnetic Bracelet RISK FREE for a full 180-days and feel the difference for yourself! If for any reason you are not COMPLETELY satisfied you can get a fast, prompt refund. No questions asked. 【Adjust size easy】Length 7.5 in,can reduce/add 0.6 in by remove /add one link, so 0.8 in for 2 link. Free size adjusting tool and instruction , allows you adjust size easy at home. If you have any questions about this product by MagEnergy, contact us by completing and submitting the form below. If you are looking for a specif part number, please include it with your message.